After dropping off your passengers at Butler Aviation, you stop at the service counter to pay the nominal landing fee Logan charges and to take a break for coffee and danish. Now, as you walk back to the transient ramp where you left the aircraft, you glance up and notice the overcast seems to be darker—evidently the weather is continuing to deteriorate as expected. You unlock the aircraft door, take your clipboard and charts, and head for the pilot's lounge and a courtesy phone to check on the weather. Things have deteriorated, but only slightly. There's a solid ceiling throughout the area now and the breeze seems to have picked up, as was expected with the passage of the front, but the front itself has remained weak. There's no significant weather, and although you can expect to encounter actual IFR conditions at the lower altitudes, there's nothing of particular concern. So far it seems unlikely that Danielson will fall below minimums; that is, you're likely to have much better ceiling/visibility conditions than the required minimums of 1180 feet and 1¼ miles, respectively. In the unlikely event that you should need an alternate airport, however, you probably would be better off simply to return to Logan where an ILS would be available. Figure 12-3. 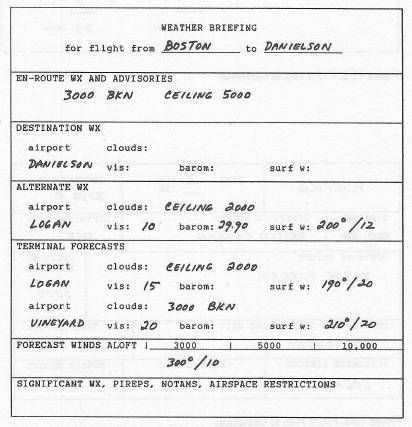 Flight Plan to Danieison of 3000, which might leave you in the soup for much of the way, but the flight is short. Maybe you'll luck out—3000 might turn out to be between layers, a situation you find to have a pleasant, if somewhat lonesome, eeriness to it. Squawk one one three zero. You're route has been changed, but this one's better. You set Nav 1 on 117.40 for Putnam and center the needle (TO). The DME readout divided by two gives you your ETE to Putnam. You leave Nav 2 on Boston for now. Stay behind the red Aero Commander that's just ahead of you. Four Six Foxtrot Tower on one one niner point one so long. Four Six Foxtrot Boston Tower position and hold. On one twenty-four point five so long. Expect the VOR-A approach to Danielson. Set Nav 1 and Nav 2 both on Putnam. Use Nav 1 to home on the VOR. 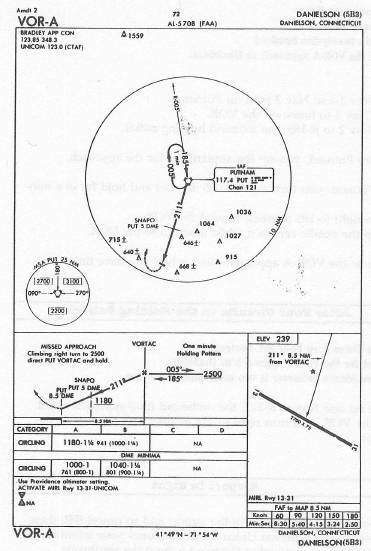 Set Nav 2 to R-185, the inbound holding radial. 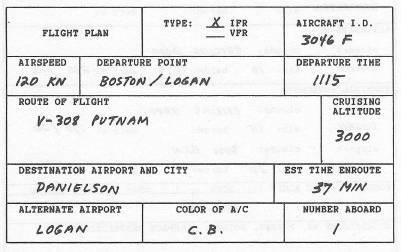 Before Putnam, you set the airplane up for the approach. At Putnam, you turn right to 005 degrees and hold for one minute. Turn right to 185 degrees, toward the VOR. Keep the needle centered while inbound to the VOR. Review the VOR-A approach plate, when you have time. The Providence altimeter is two niner point niner five. You set one Nav to R-211, the outbound final-approach radial. At the VOR, you turn right to 211 degrees and begin your descent. 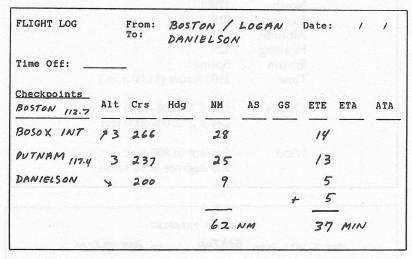 You advise Bradley you have the airport and so cancel IFR; then, you switch to Danielson Unicom and announce your intentions. Circling to land, remember the wind is from the southwest.